Bird Feeders Made in the USA by Looker Inc. Our clients include over 650 specialty stores nationwide. 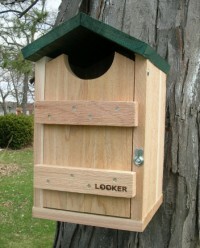 Looker is a leading manufacturer of Screech Owl House. Entrance hole approximately 4" Diameter. Also for Kestrels & Flickers. 9" x 10" x 15". Natural body with green roof.